Latex gloves supplied from Latex Gloves Equipment Exporter,are one kind of gloves. They are different from ordinary gloves. They are made of latex. Can be used as home, industry, medical, beauty and other industries, is the necessary hand protective equipment. Latex gloves are made of natural latex with other fine additives. The products are treated with special surface and are comfortable to wear. They are widely used in industrial and agricultural production, medical treatment and daily life. The rubber is first sliced by the rubber refining machine and then sent to the sol cylinder to mix with the gasoline sol. After emulsifying and modulating, the sol is pumped to the tundish. The gasoline-soluble rubber solution is fed from the top of the distillation column and heated by steam. The light component gasoline is heated into the gas phase, and the gasoline gas is mixed and cooled by cold water in the oil-gas cooler. Oil and water mixture to the oil and water separator, oil and water stratification. The upper gasoline is recycled, and the lower water is sent to the cooling tower by the water pump. The latex in the distillation tower kettle is sent to the emulsion mixing tank under its own pressure to be stirred and mixed, and then to the centrifuge to separate the raw latex of gloves, and then to be used after color mixing and filtration. The glove model ,as one part of Latex Gloves Production Line,it was cleaned with acid and alkali and then washed with water. The cleaned model was immersed in hot water and heated until it was soaked with coagulant and dried before being soaked with glue. After rubber dipping, send to oven for preliminary drying, add fiber inner cover, then send hot water to oven for vulcanization, drying and forming. After demolding, the gloves are checked for air inflation, shaped at low temperature, dried at medium temperature, washed, dehydrated and dried, and then packaged and sent to the finished product warehouse. (1) mold washing wastewater and gel containing wastewater generated from washing process of each production line; (2) a small amount of ammonia gas is produced in the production process; (3) dust generated in the drying process; (4) air pollutants such as SO2, NOx and particulate matter generated during boiler operation; (5) SO2, NOx, particulate matter and other atmospheric pollutants generated by the operation of the standby diesel engine unit; (6) wastes generated in the production process; (7) sludge generated by sewage treatment stations, etc. The water treatment process adopts physicochemical, biological contact oxidation and activated carbon adsorption. The technological process consists of mechanical grille, regulating tank, air flotation tank, biological contact oxidation tank, sedimentation tank, sand filter and activated carbon filter tank, and wind machine room. Waste gas treatment technology scripture keuli hemp dust collector, and then with alkali water reaction, desulfurization dust. 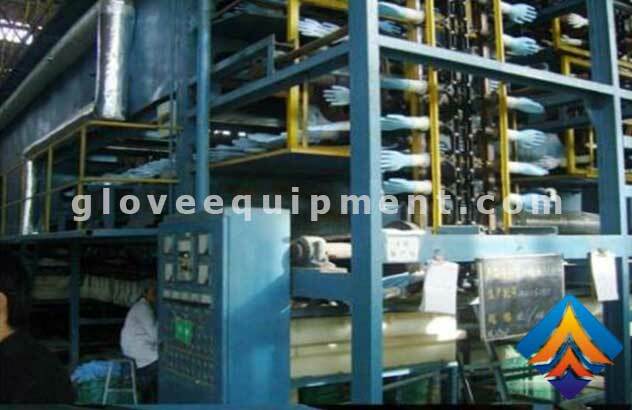 Latex gloves from Latex Gloves Production Line Manufacturer are suitable for automobile and battery industries. FRP industry, aircraft assembly; Aerospace; Environmental cleaning and cleaning. Latex gloves have wear resistance and puncture resistance. Acid and alkali resistance, grease, fuel oil and various solvents; Has a wide range of chemical resistance, oil proof effect is good; Approved by FDA. Latex gloves feature unique fingertip texture design, greatly enhance grip, effectively prevent slipping; No palm pattern patent design, uniform adhesive penetration, enhance the protection; Unique hand design with cotton lining for added comfort. Gloves are divided into cotton yarn, plush, leather and so on. Materials and fibers used to make gloves.